If you’re looking for an excuse to eat your veggies, here ya go. 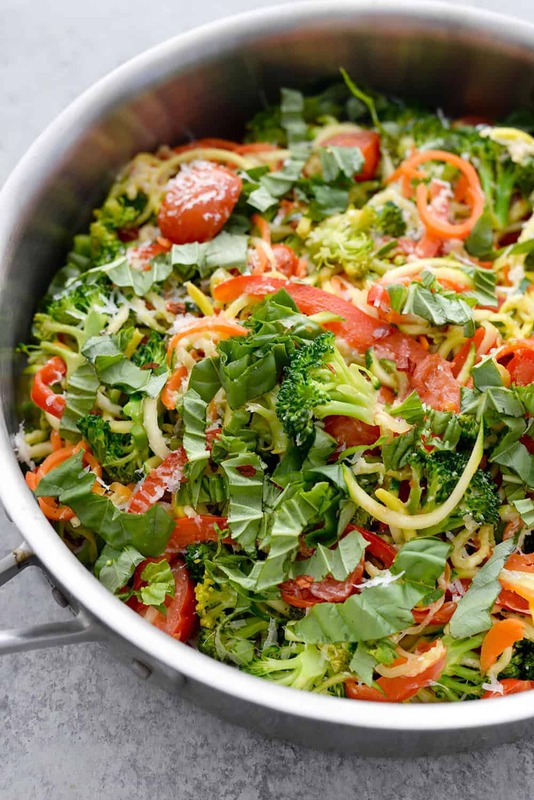 This dish is almost entirely made out of vegetables and the perfect thing to eat when you are craving comfort food but also healthy. 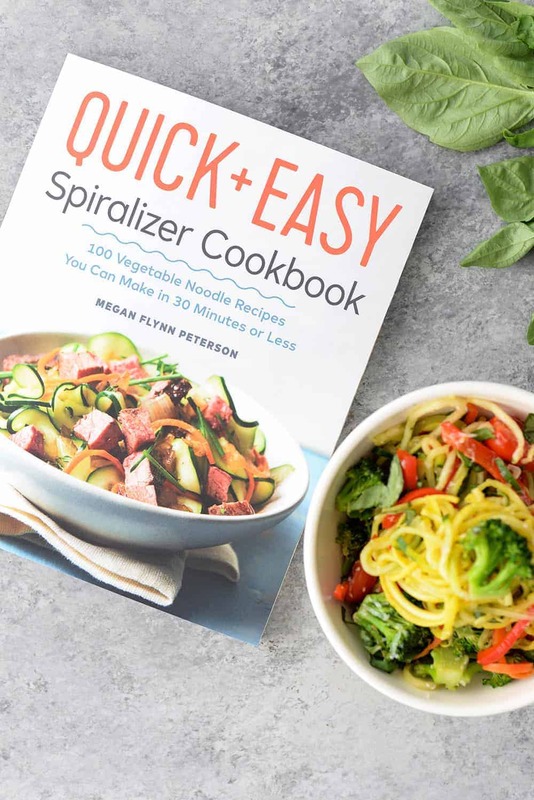 This zucchini noodle pasta primavera comes from the Quick and Easy Spiralizer Cookbook which as you may have guessed is packed full of spiralizer recipes. Are we still into spiralizing things? I admit that mine has been hanging out in the basement for the last few months, but once I brought it out of hibernation to make this dinner, I found myself turning to it over and over again. I’ve been trying to eat more vegetables and recipes like this make it so easy. One area of research that I’m always interested in learning more about is longevity and chronic disease prevention. It’s why I’m such a big fan of the blue zones and plant-based diets. Research shows over and over again that those who eat less animal protein and more vegetables not only have a reduced incidence of most chronic diseases, they also live longer. I’m also intrigued by the idea of fasting/intermittent fasting and aging. You know I’m not a fan of counting calories and I’ve let intuition be my guide for almost the past decade. Still, I’m trying to learn more about this subject and what the conclusions say. Are you interested too? 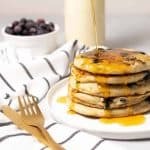 I’ve been thinking about doing a few posts about the connection between plant-based nutrition and longevity. Is this something that we feel like we understand or something we’d like a deeper dive into? Whatever your dietary patten, you are going to love this simple vegetable pasta recipe. I spiralized the zucchini and the squash and then peeled the carrot and thinly sliced the bell pepper. My spiralizer isn’t hearty enough to withstand spiralizing a hard carrot and it was just as easy to peel it. Same goes for the pepper. My knife skills are much faster then attaching the pepper to the spiralizer. When you make this, get all of the vegetables ready ahead of time as it cooks really fast. Since this is an almost all-vegetable meal, I think it benefits from a shaving of parmesan cheese at the end. I know I just talked about the benefits of a plant-based diet but adding a little cheese really made this one come to life. If you are vegetarian, then I recommend doing that. If not, then I recommend maybe a little pesto, cashew cream or bit of non-dairy butter? Just something to bring everything together in a light sauce. The leftovers don’t keep well, so I’d only plan on cooking what you plan on eating. 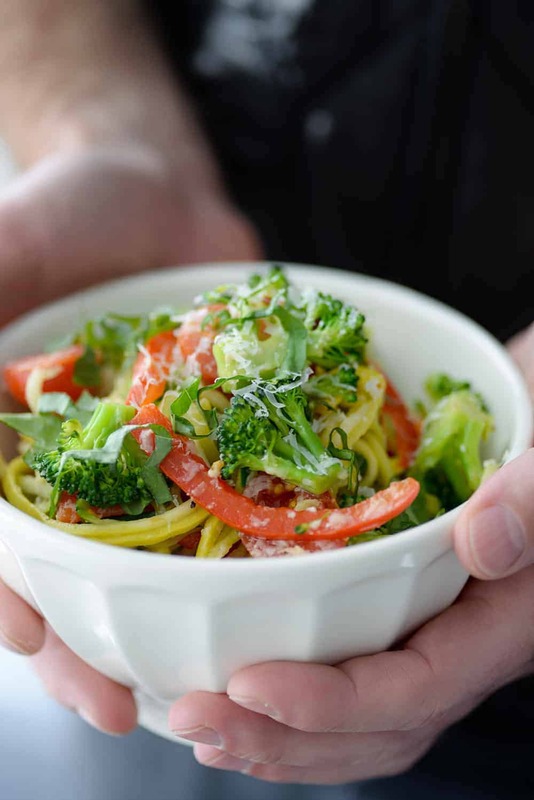 For a heartier pasta primavera, you can add in cooked spaghetti noodles (we did this one night with a little cashew cream and parmesan cheese and it was delicious) or some white beans. As a thank you for being a reader, Rockbridge Press sent me an extra copy of this cookbook to gift to one of you. I’m so humbled that anyone shows up to read my ramblings and make my recipes. 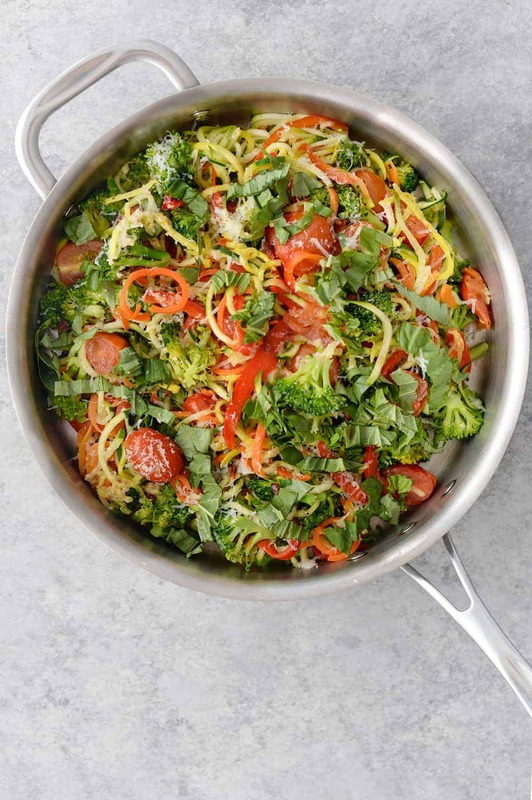 Zucchini Noodle Pasta Primavera! This vegan, gluten-free, grain-free dish is so delicious! If you want a healthy, vegetable filled dinner, you’ve gotta try this. In a large skillet over medium-high heat, heat the olive oil. Saute the garlic for 1-2 minutes until fragrant. 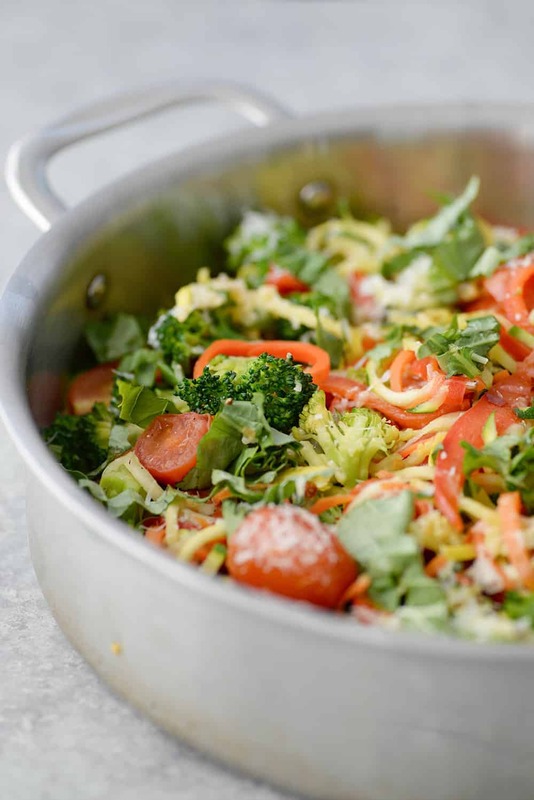 Add the carrot and bell pepper noodles, broccoli and cherry tomatoes and stir gently. Allow to cook for 3-4 minutes until the noodles begin to become tender. Season and salt/pepper. Add the zucchini and yellow squash noodles. Toss everything together and cook for another 3-4 minutes. Add the red pepper flakes and season again with salt and pepper. Remove from the heat. Add in the basil and Parmesan (if using), toss one last time and serve. This dish is so pretty! I’m a big zoodle fan. I’ll have to try this one out! 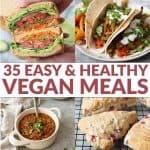 I would love to see some raw food recipes! Awwwwsome!! I would love more gluten free options and plant based ideas. Your blog rocks! Alex this looks delish. 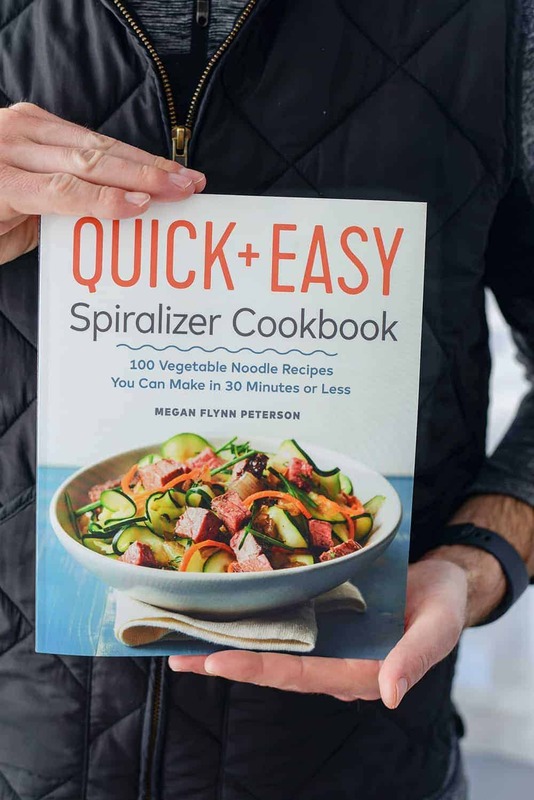 I would love to see you develop a soup with Zoodles. Thanks so much for sharing! The photos are gorgeous! I can’t wait to try It! My doctor says I need to change my diet and so I’m trying more plant based recipes. Thank You. This sounds delicious! I can’t wait to try it. Looks great! Probably be good with some marinara sauce too. This looks very yummy! I’ve saved it to try when my zucchini comes in.